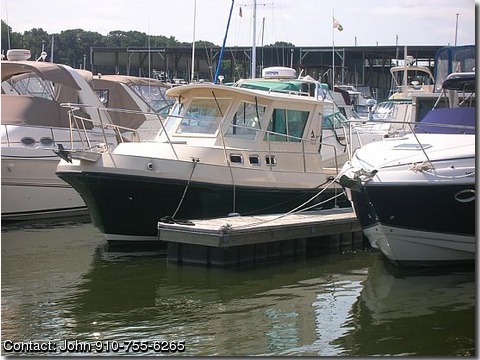 BOAT OWNER'S NOTES: Feel free to call John @ 910-755-6265. Albin Larson in 1899 to handle the rugged waters of the Scandinavian Coastline. of Downeast boats to the US. your wishes in style and with grace. stability and protects the prop from damage. The wheelhouse is fully enclosed at the rear with dark green Sunbrella and heavy duty clear vinyl windows.